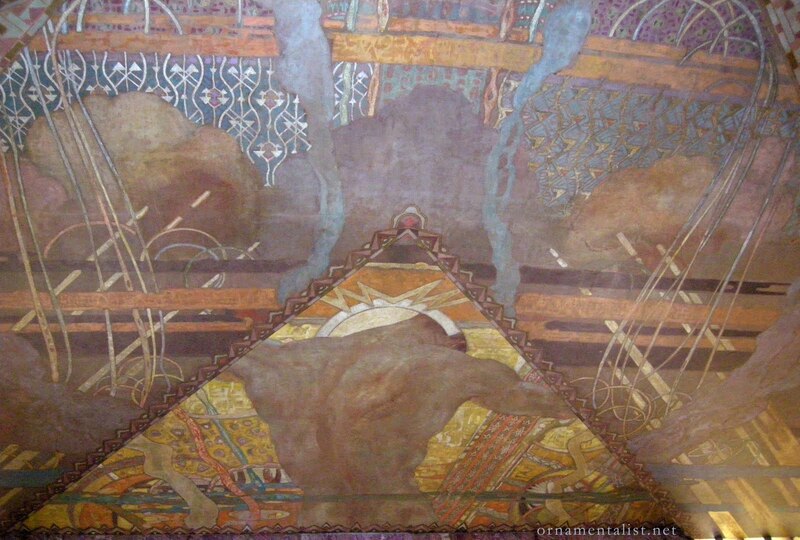 The Ornamentalist: Chrysler Ceiling Mural: a quick look! 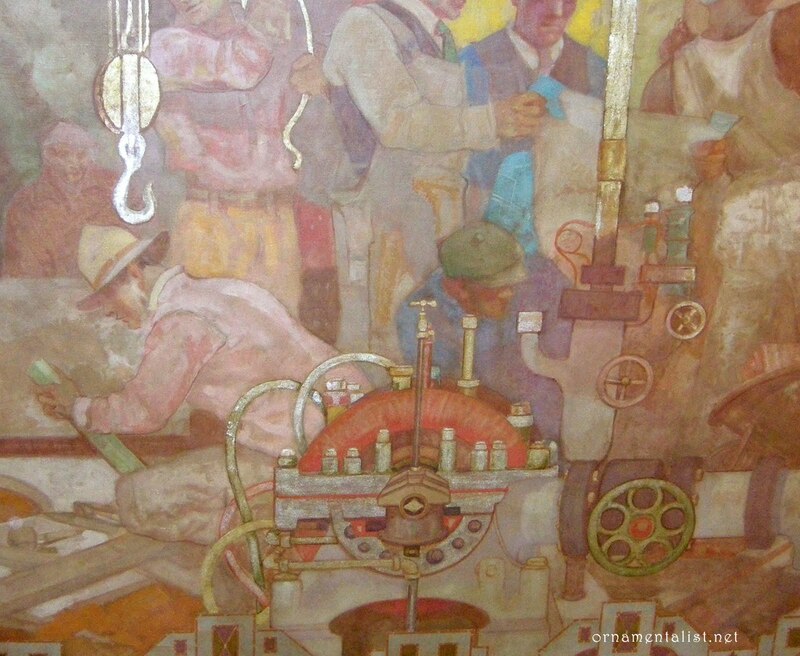 Chrysler Ceiling Mural: a quick look! During a recent visit to New York City, I had a short morning to take in a couple of sights with my friend Emily, visiting from England. Fortunately if you are fan of architecture, and Art Deco surface ornament in particular, there is plenty to see just walking through Grand Central Terminal and the street outside, on the way to one of my all-time favorites, the Chrysler Building. 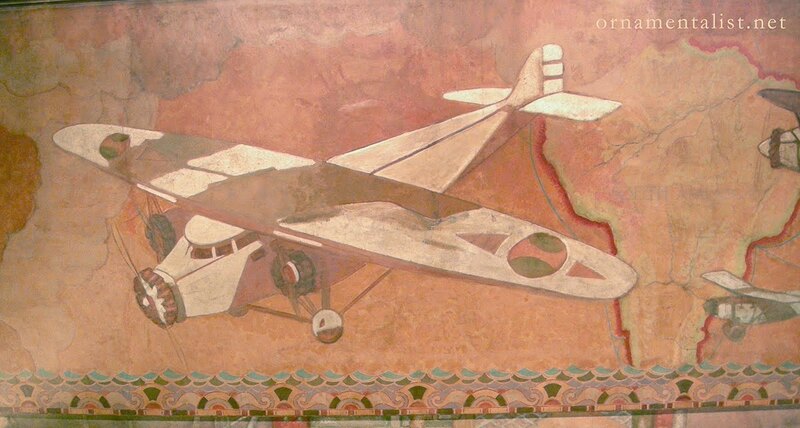 At the time of its completion in 1930, the Chrysler was the tallest building in the world, and the lobby ceiling mural by Edward Turnbull, entitled Transport and Human Endeavor was the largest mural in the world, at 78 by 100 feet. 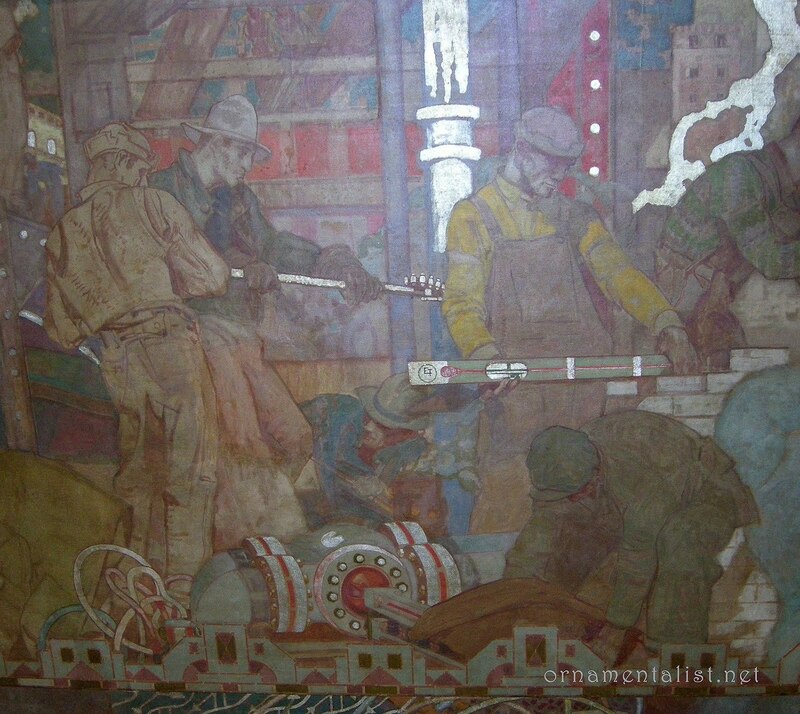 Originally titled "Energy, Result, Workmanship and Transportation," an obvious sense of ambition informs the mural on other levels - it's all about achievement, hard work, accomplishment; being the biggest, best, fastest, strongest, first! Painted on canvas and applied marouflage to the ceiling, this mural has thankfully survived age, and several renovations, including the inexplicable addition of recessed can lights, which were removed during the most recent restoration in 1999. It is hard to appreciate the ceiling mural because the lobby is rather dark. With its rich red Moroccan marble walls and elaborate inlaid wood elevator doors, there is a lot to see without even looking up. But if you can stay long enough to get used to the cocktail lounge lighting, you will notice so much more. The focal point in Turnbull's mural: muscles and decorative ka-pow! What caught my eye this particular visit was all the great decorative elements of the mural. Along with Art Deco borders, there are transitions, and patterns, with a nod to the Vienna Secession. Look closely and you will see colors, patterns, and pistons! Machines are cool! Metal leaf is used throughout this painting to great effect. 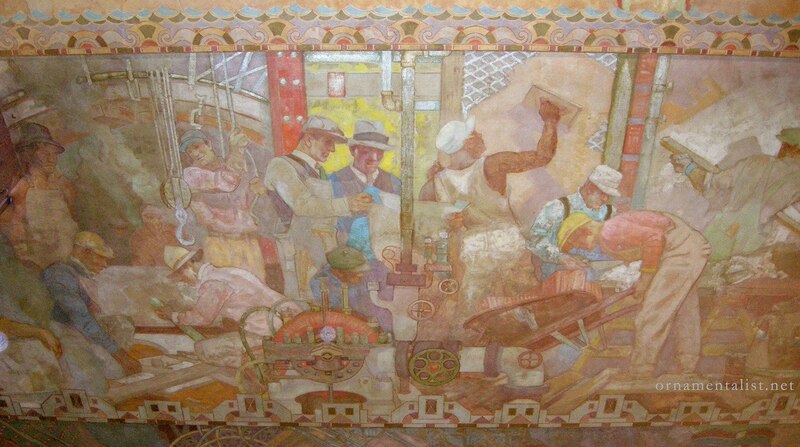 I love this scene, which is painted with pattern, figures, color, and even one figure which is only sketched in. Note the artist's initials "E.T." on the level. Isn't it fantastic??!! I love the Chrysler Building! Thanks for posting these images.